At Sanford and Son Junk Cars, we are interested in purchasing the entire car, all years, makes, and models. Selling your car just got easier in East Point (Fulton County) Georgia. Get a cash offer on your car in seconds with NO TITLE NEEDED. We buy junk cars of all makes and models in any condition and location. For your convenience, we are open 7 days a week. Schedule a free towing pick-up today. We have been in business for over 15 years & we service all of Georgia (locally owned and operated). Get the best prices for your junk car or damaged car. Recycle your car, truck, SUV, boat, camper or RV. and get the cash for your unwanted vehicle FAST! We offer the best price for your wrecked car & tow it away for FREE! 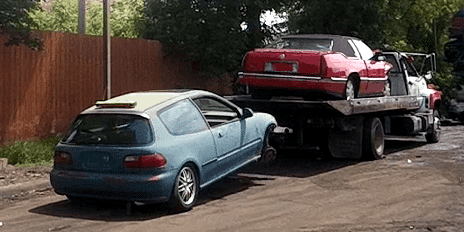 Get Cash For Junk Cars Now Get an Offer in Seconds. We Pay and Tow Away, Sell Your Car Today! We then recycle junk car parts or resell your auto so you no longer have to pay insurance on a vehicle that is not running. We buy SUV’s, vans, trucks, motorcycles & trailers. We will buy Ford, Toyota, Chrysler, BMW, AUDI, GM, Hyundai, KIA, Mazda, Mitsubishi, Nissan, Volkswagen, Volvo & More! Free Towing -Fast Service! We offer FREE towing to a car junkyard in near East Point, GA. Same Day Free Tow in most Georgia towns & cities.